The scalable Florida map on this page shows the state's major roads and highways as well as its counties and cities, including Tallahassee, the capital city, and Jacksonville, the most populous city. To display the map in full-screen mode, click or touch the full screen button. To zoom in on the Florida state road map, click or touch the plus (+) button; to zoom out, click or touch the minus (-) button. To scroll or pan the zoomed-in map, either (1) use the scroll bars or (2) simply swipe or drag the map in any direction. (The scrolling or panning method you use will depend on your device and browser capabilities.) At any time, you can display the entire Florida road map in a new window or print this page, including the visible portion of the map. The following Map Legend and Scale of Miles apply to the road map on this page, at its largest displayed scale. Florida's primary Interstate Highways connect its major cities and facilitate travel between Florida and its neighbors. I-4 crosses Florida's midsection between Tampa and Daytona Beach, bisecting Orlando along the way. I-10 begins near Jacksonville, traversing the Florida panhandle to the west. I-75 serves the Florida Gulf Coast towns between Bradenton and Naples, while I-95 runs along the Atlantic coastline between Jacksonville to Miami. In addition to these routes, the Florida Turnpike serves motorists between the Miami area and I-75 in central Florida. Florida's auxiliary Interstate Highways serve several urban areas. I-110 connects I-10 with downtown Pensacola. I-195 connects I-95 with Miami Beach. I-275 connects the Tampa and St. Petersburg metropolitan area with I-75 and I-4. I-295 provides an inner loop through western Jacksonville. I-395 is a short feeder highway near downtown Miami. I-595 connects I-95 near Fort Lauderdale with I-75 to the west. The Gulf Coast Drive along Florida's panhandle passes through scenic woodlands and wetlands on its way from Panama City to Tallahassee. Travelers will find St. Joseph Peninsula State Park, St. George Island State Park, and Ochlockonee River State Park, as well as the Apalachicola National Forest and St. Marks National Wildlife Refuge. Visitors to the refuge can encounter 200 species of bird, as well as view St. Marks Lighthouse at the head of Apalachee Bay. The Overseas Highway, part of U.S. Route 1, traverses the Florida Keys between the Florida mainland and Key West. 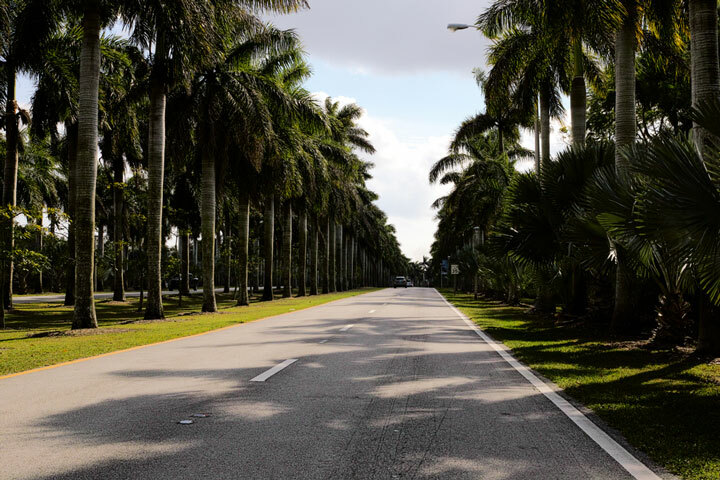 More information about scenic roads in Florida is available on this Florida Scenic Highways site. For more information about Florida's roads and transportation infrastructure, visit the Florida Department of Transportation website. For Florida road traffic conditions, visit the Federal Highway Administration's Florida Traffic Information page. Florida-Map.org is a State Maps reference source.